Almost three years ago Antonio and I arrived in his hometown in Spain at the end of our epic bicycle tour, which we started in Iran six months before. Now, it is time to go on another bike ride, although substantially shorter and only in one country: from September to November we’ll be riding across Japan! After 2,5 years of living a more-or-less sedentary office life (which I like more than I’d ever imagined), it is time to move again, albeit only for a little while. Here is a very rough approximation of our route, which is almost 100% likely to change because bike trips are notoriously hard to plan, so we’ll see what happens. We start up North in Sapporo, and finish in Tokyo, but only after making a loop (partially by train) via Hiroshima. So basically we’ll see the rural (wild, with a chance of bears!) 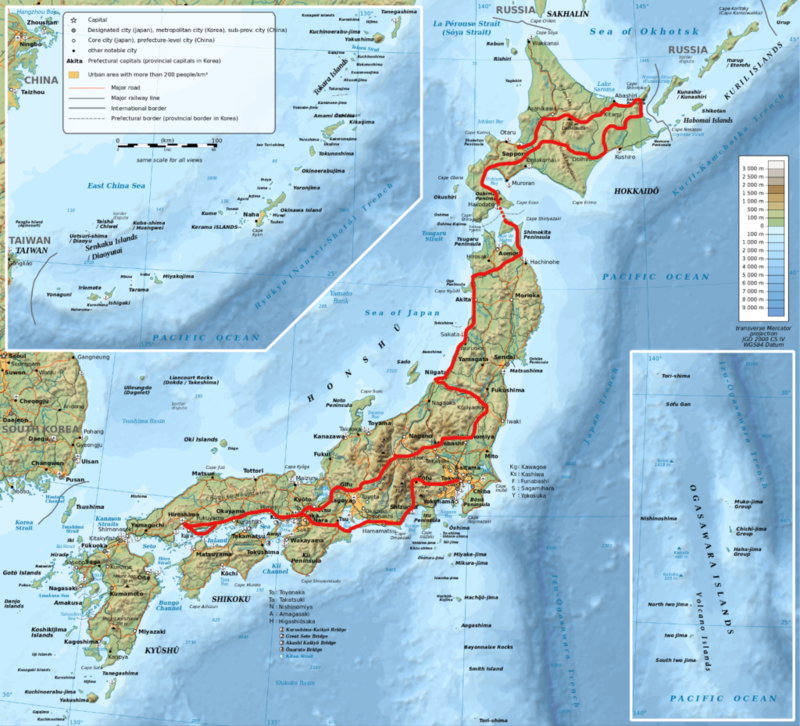 North, the sea of Japan coastline, some of the interior, straight through the Japanese Alps and wrapping up with some major cities (Kyoto, Hiroshima, Tokyo). Should be fun! We still have most of our gear from the last trip, including the bikes and tent. Some items got an upgrade: Antonio rebuilt his front wheel by hand to accommodate a dynamo, and we both got plushy down sleeping bags because we expect near- (or sub? if we’re unlucky?) freezing temperatures and I honestly don’t know how we survived before. There will probably be a lot of rain, because we’ll be smack in the middle of autumn and Japanese autumns are very wet, so we also got a tarp so we can cook dry and don’t have to spend rainy rest days crouched in our tent. We spent hours and hours researching and practicing fancy knots to set that damn thing up, so it better be worth it. (and by ‘we’ I mean Antonio). I’ll try to write frequent updates about our adventures but we’ll only have our phone and tablet with a very unreliable internet connection, so I might have to wait until we find one of those super-fancy Japanese internet cafes full of gamerkids but where you also can have a beer and shower and take naps. That sounds almost too good to be true, so I hope they actually exists. We’re excited about all the food, slightly anxious about the bears and the weather, but mostly looking forward to explore an unfamiliar country with new landscapes, customs, habits and sights. Stay tuned! Read all posts about our Japan trip.